Food Safety Knowledge Lab (FSK-Lab) is an open-source extension plugin to the Konstanz Information Miner (KNIME). FSK-Lab enables KNIME users to work with FSK models within KNIME. A running instance of KNIME is a prerequisite. It can be downloaded here. Due to avoid installing issues under WINDOWS, the provided zip-version should be used and unzipped then. The KNIME folder itself can be placed and run from anywhere under Windows without admin rights. After starting KNIME, the user will be asked to create the KNIME-WORKSPACE, were all the workflows will be stored. After restarting KNIME, please make sure to select the right one to access your files (it will be preselected). HINT: In order to avoid later issues, never copy the KNIME_WORKSPACE, import it only! Please following these instructions to get further instructions how to install knime . 1. The amount of RAM available in KNIME might be extended by changing the value in the line ‘-Xmx1024m’. An example would be ‘-Xmx4g’, if 4GB (=4x1024m) of 8GB RAM should be used. 2. If the connection to a KNIME-Server through KNIME fails, it might help to increase the response time. Simply add the line ‘-Dcom.knime.enterprise.client.connect-timeout=10000’ to the ini-file. 1. Add the repository to KNIME via Help > Install New Software > Add. The corresponding URL (https://dl.bintray.com/silebat/fsklab_icpmf) should be entered in the ‘Add Repository’ dialogue along with a meaningful name. 2. 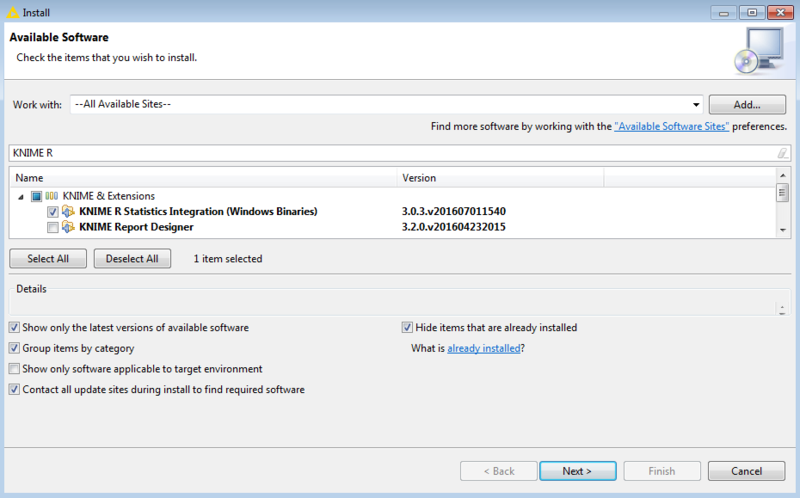 Now this repository can be selected in the installation menu via Help > Install New Software > ‘Work with’-pull down menu. FSK-Lab is based on R (https://www.r-project.org) and an essential component for it to function. For the purpose of convencience it is provided as a feature inside of the FSK-Lab plugin. You can pick either the 32 or 64 bit version to be embedded into the plug-in, depending on your operating system. If you have R already installed on your system and you prefere to use that version, do not tick either of the options. 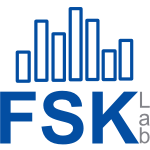 Currently you have the option of installing additional FSK nodes, the “legacy FSK-Lab nodes”. They provide compatibility for older fskx-files. Tick ‘FSK Lab Feature’ and follow the prompts after pressing “Next”. 3. After restarting KNIME, FSK-Lab Feature should appear now in KNIME under Help > Installation Details. 1. The R repository should be already available in the installation menu via Help > Install New Software > if All Available Sites is chosen in the ‘Work with’-pull down menu. 2. Fold open KNIME & Extensions and tick KNIME R Statistics Integration (Windows binarys). 3. Follow the prompts after pressing Next and after a reboot, the R binary feature should appear in KNIME under Help > Installation Details. 4. In this last step, KNIME needs to know were the R binarys are installed via File > Preferences. 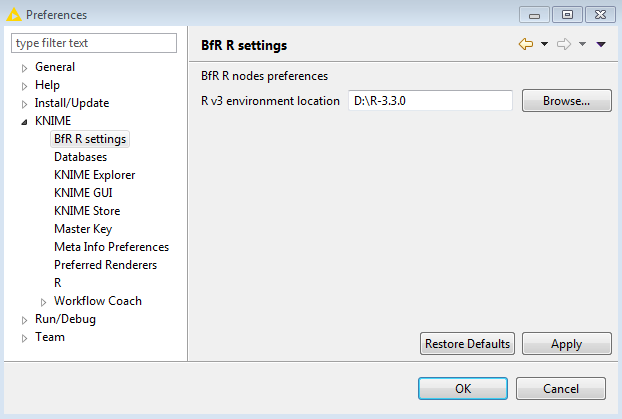 In the menu choose KNIME > BfR R settings and on the right site browse to the local path of the binarys. If installed via the update site they are located in the KNIME installation folder > plugins > org.knime.ext.r3.bin.win32.x86_…R-Inst. Don’t use a subfolder of R-Inst! Press Apply and enter the same path in the Menu under KNIME > R and press ok.HINT1: If a seperate R version is used and the KNIME message ‘no R.exe file found in the R-folder’ appears, even if its there, the reason might be a wrong bit version was installed. The 32bit version should be present in the subfolder ‘bin/i386’ and the 64bit version in ‘bin/x64’.HINT2: The ‘BfR R settings’ exists only for the use along with FSK-Lab and in parallel to the regular’R’-setting of KNIME. This allows to use different R folders/versions if needed. 5. If you received a message that the packages Rserve and miniCRAN need to be installed you need to start R.exe directly from its installation folder. In the R console enter “install.packages(c(‘Rserve’, ‘miniCRAN’)” and press enter. There should pop up a list of download sites then. Choose one nearby and confirm. After the message that the library was sucessfully downloaded, you can close it via “q()”. In the library folder of R should a new folder Rserve appear now. For R running in MACOS, there is a specific R version for MacOS required which may be downloaded from here. Besides these three packages, MacOS requires also the XQuartz software which can be obtained at http://xquartz.macosforge.org. In order to test the FSK-Lab nodes in KNIME, there is a zip-file provided here. It contains the needed files to create FSKX-model-files by using the FSKX-Creator-node in KNIME. Please, make sure to assign the corresponding files in the configuration dialogue of the Creator-node. The model metadata involved in the FSK models includes but is not limited to the table below. The complete and currently used metadata schema can be found here. Creator Person contributed to the encoding of the model in its present form by implementing the model in the software solution. Created date Date upon which the model was created. Format: MM/dd/yyyy. Modified date Date of last modification to the model. Format: MM/dd/yyyy. Rights Information about rights held in and over the resource. Typically, rights information includes a statement about various property rights associated with the resource, including intellectual property rights. Creates an FSK object with the script and metadata provided by the user. The variables defined in the parameters script are ensembled in a default simulation called defaultSimulation. Working directory. Directory with resource files used by the model: plaintext, CSV and R workspace (optional). Selected XLSX spreadsheet. File path of the XLSX spreadsheet with meta data (optional). In unspecified or error occurs the table will be empty. Selected sheet. Name of the selected sheet in the spreadsheet. Creates an FSKX file with the scripts, metadata, model encoded in SBML, workspace, working directory, simulations SedML and R packages in the FSK object. Output path. Location to file. May be an absolute URL, a mount relative URL or a local path. Creates an FSK object with the scripts, meta data, simulations, resources and R packages in the referred FSKX file. Runs the input model and updates its workspace with the model results. Visualization scripts with interactive output such as Plotly are not supported. Width. Width of the plot. Height. Height of the plot. Resolution. Resolution of the plot in PPI. Text size. Default point-size of plotted text, interpreted as big points (1/72 inch) at the given resolution. Simulation. The name of the selected simulation to run. If no simulation is selected then the default simulation will be selected. Plot generated with the provided visualization script. If the input FSK model has no visualization script then this port will hold no image (optional). Edit the scripts and the model Meta data in an FSK object. In case there is no input model connected then it will create a new model from the user interface. When a new model is created, a default simulation called defaultSimulation will be created with the parameters defined in the metadata (the model math part). Extracts the R workspace out of an FSK object. The R workspace may be used with KNIME R nodes. If the R workspace is null or non-existent (as when the model has not been run), the generated RPortObject would be null. Extracts the metadata from an FSK object into a KNIME table. Behaviour: Extracts the metadata from an FSK object into a KNIME table. Creates simulations for a FSK model. 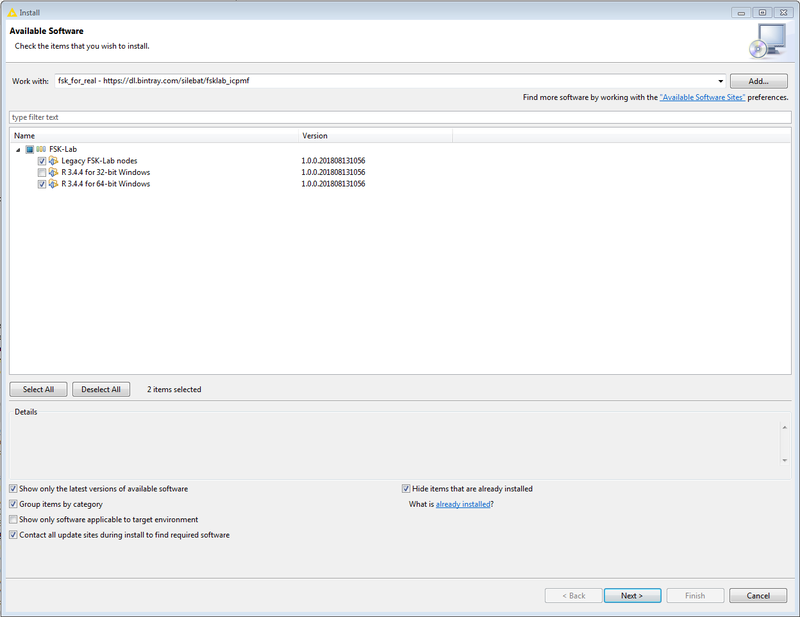 The defaultSimulation settings created by the FSK creator and Editor are disabled by default. The simulation selected in the view is set as simulation to run in the runner node. Values for all the parameters in the FSK model. Currently only real numbers are supported. Joiner of FSK objects. Joins two FSK objects and produces a combined FSK object which keeps both of the provided objects. Writes the current workflow to a FSKX file. This node can be used to save the current workflow with all its nodes and connections except the workflow reader itself in an FSKX file. This workflow will be copied and saved in a meta node. The output ports of the selected node will be exported using the output ports of the meta node. The user must select which of the present nodes should be used to export the output ports to the meta node. Reads the workflow stored in an FSKX file. Location of the FSKX file, as an absolute URL, a mount-point relative URL or a local path. If checked, the workflow stored in an FSKX file will be loaded into the host workflow as metanode and can be edited before execution. Otherwise the Workflow Reader will execute the workflow from the file in headless mode and expose the output. These tutorials were published with the article FSK-Lab – An open source food safety model integration tool at https://doi.org/10.1016/j.mran.2018.09.001.